Formula One confirmed Friday that Malaysia’s Sepang International Circuit—considered by Ferrari driver Kimi Räikkönen to be a good place for an ice cream break—will host its last F1 grand prix after 19 years this year. In its place, the German and French grands prix will be returning. Part of me is OK with Malaysia dropping off the calendar, given its overkill arrests of nine Australian fans last year for celebrating their countryman Daniel Ricciardo’s win wearing nothing but banana hammocks. C’mon, Malaysia. I know it’s a more conservative country, but politely ask them to put real pants back on and cut ‘em some slack. Yet I’m still sad to see the Malaysian Grand Prix go. Its unpredictable weather may be known for rain delays, but the sheer chaos unleashed during a Malaysian wet race is the stuff of legends. Rain or shine, the Sepang International Circuit is widely considered one of the better modern circuit designs as well. Sepang is also the cradle of Formula One meme creation, with Ferrari race engineer Rob Smedley’s soothing “Felipe, Baby” radio call and Kimi Räikkönen’s ice cream break both going hilariously viral among fans following a rain-shortened 2009 race. 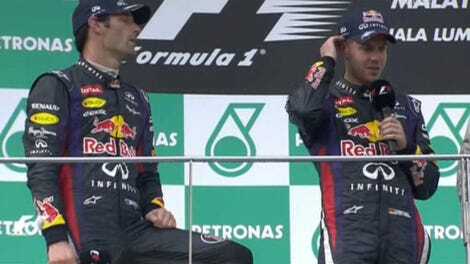 The 2013 Malaysian Grand Prix birthed the infamous “Multi 21” Red Bull team orders controversy, and one of the greatest F1 podium scenes in modern history when Mark Webber was visibly annoyed with teammate Sebastian Vettel for not letting him by. That being said, Formula One fans close to most teams’ European headquarters have been clamoring for a return to France and Germany, so these are welcome returns to the calendar. Circuit Paul Ricard will host the revived French Grand Prix, and Hockenheim has a renewed contract to host the German Grand Prix on even-numbered years, per Autoweek. We’ll see if they can strike a deal where the Nürburgring or somewhere else can pick the German Grand Prix back up on odd-numbered years soon, I hope. It’s been bizarre to have no grand prix in the home country of the sport’s most dominant team. What’s your favorite insane Malaysian Grand Prix moment? They have one last shot this year to make it a good one, so let’s hope this year’s race delivers.